When Christopher Columbus first visited the island in 1494 he named the bay Golfo de Buen Tiempo (Fair Weather Gulf). The weather nor the fairness haven’t changed since. 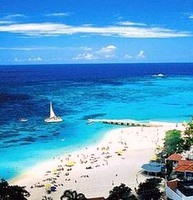 Make no bones about it, however, Montego Bay is tourist mecca these days. It is built up with hotels and resorts so chances are you won’t have that pristine beach all to yourself. If you can put up with a little noise and if you ignore the fact that the city itself has a crime rate that is estimated at 28 times higher than that of New York City, you can have an excellent time in Montego Bay, especially if you stay on the beach sipping on a cool drink all day long.